We take great pride in providing excellent food and service to all our clients. We prepare all our dishes using the freshest and finest of ingredients on every site. Our ingredients are purchased fresh daily, from the main London markets and our food is additive and GM-free. Everything we do is planned to exceed our customers’ expectations. Our fully-trained chefs are on site each and every day and devise new menus featuring dishes that contain less salt and fat. We strive to introduce healthier versions of our customers’ traditional high fat favourites. Our dining environments mirror the best eateries and are kept up to date, providing a relaxing place to enjoy superb quality food. Each of our employees is rigorously trained in health and safety and food safety, prior to working in any of our operations. Team members are trained to a minimum of Level 2 in Basic Food Hygiene and most attain certificates in first aid, fire training and stress awareness. All senior staff have achieved Level 3 Food Hygiene. At Bon Appetit it is important to us that our catering services provide healthy and nutritious food for all of your staff. That means that consultation with our clients prior to starting work is vital. There are a wide range of dietary requirements to consider, from those people making a lifestyle choice such as vegetarianism and paleo through to food allergies and coeliac disease so that we can provide the very best experience for everyone. Bon Appetit is committed to maintaining the highest standards of excellence towards health and safety and hygiene, and achieves this through an absolute adherence to in-house training and weekly, monthly and quarterly H&S audits. We have stringent measures in place to ensure that every one of our units strictly conforms to all EHO guidelines. We run bespoke H&S courses for all members of staff at our head office and new employees undergo training before starting work. We focus on the most important elements of catering and then get them absolutely right. 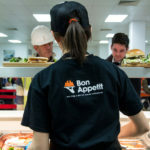 For many years Bon Appetit has successfully encouraged customers to eat more healthily. We achieve this by providing dishes that are low in glycemic index (GI) value, this lets diners remain fuller for longer so they do not require extra large portions or snacks throughout the rest of the day. Low GI cuisine provides a twofold benefit to employers, managers and teachers. By providing nutritionally balanced, slow energy-release food our customers are more efficient and alert, ready to take on the rest of the day. Our highly efficient operations are ideal for education, health and public sectors, as well as commercial and industrial markets. We have transformed customer perception by proving that it is possible to deliver taste, choice and service, consistently. Bon Appetit menus are compliant with government nutritional guidelines because regardless of the sector we work in, our aim is to satisfy the nutritional needs of our customers who deserve fuel that maintains their good health and well-being. 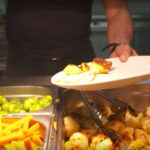 The choice, quality and taste of our food is enjoyed by university students, manual workers, young people and office staff alike, with the benefits they derive from the nutritional content of our menus are equally shared.